Welcome to Used Car Face Off, where we find two similar or similarly priced used cars and ask you which one you would buy. Choose wisely! Italian sports cars are one thing, but an Italian four-door sedan sounds like a reasonable car for people who need some sense of practicality – as long as you don't need reliability with your practicality. Aside from new Maseratis that are apparently everywhere, Americans haven't traditionally gone for four-door sedans from Italy, choosing to pick the country's sports cars and small cars. Which is why the few that still linger in this country look like they make sense. Well, sometimes. The Alfa Romeo 164. What more is there to say about it? It's the obvious choice for people who want to rationalize purchasing an Italian sedan and think of this as a Saab 9000 in a Pininfarina suit. And stuff like this 1995 164LS looks really good today. The design is 25 years old, but there's no way it looks dated. And this is, of course, Alfa Romeo's swan song in the U.S., at least until they reappear someday. Another totally modern aspect of the 164 is the power. With a five-speed manual and a 3.0-liter V6 making 211 horsepower, it's fast in today's figures, too. It bears repeating that this is a good-looking engine, too. Then there's this handsome interior, which still doesn't look like it came out of a BMW rival of 1995. As a real treat, all of the electrics work, apparently. Which is good, because there are a lot of them. And it's front-wheel drive, which I would view as an asset on the Saab cousin, but definitely has a perception problem on this fine Italian sedan. So the Alfa 164 is too "new car" for you? Easy. This 1975 Fiat 131 in '70s green is just the ticket. OK, it isn't exactly a beautiful car. But the 131 is so rare in this country that it's more special than the 164 or pretty much any Maserati sedan. And it's rear-wheel drive, not like there's much performance here. For a car that's motivated by just a 1.8-liter four-cylinder and a three-speed automatic, the interior is pretty accommodating. One thing that adds to the charm of the Fiat is the Italianness of the ergonomics. The 164, with its button-covered dash, looks like a Honda by comparison. I haven't seen air vents so low in the center stack since the Hyundai Elantra. And why is the clock the only piece of the instrument cluster not obscured by the steering wheel? See, you just don't get control misplacement on most cars these days. This is as time-warpy as Fiat 131s probably get. 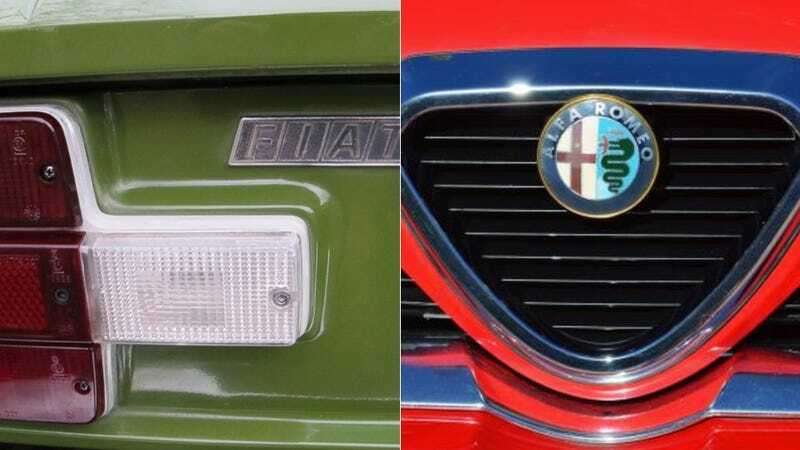 Critically, however, it's just so different from the X1/9s and 124 Spiders that make up most of the 1970s Fiats for sale here. I think I've seen one other 131 ever, so that's a big selling point for me. Alfa 164s are relatively plentiful by Italian car standards in this country. Given the choice here, I'd be brave and grab the Fiat. Yes, it's slow. That's fine, I didn't need to get anywhere.